From the very beginning of the Greek founding of the European spirit, a fruitful debate prevails between philosophy and theology. Many of the old questions have remained, yet the new ones are also being raised. What is the relationship between philosophy and theology today? Is it a conflict or a co-operation? What is the relationship between faith and knowledge? What is today the meaning of thinking based on faith? Christian faith as a subject of philosophy and theology – in the past and at present? What do the terms “Christian philosophy” and “philosophical faith” mean today? What is the meaning that we perceive in the words “God”, “Being”, “Love”, “Hope”, “Sin”…? What is the meaning of the words at all today when the sense of speech, as never before, is being established in the field of power? Are we able at all to experience the language “logos”, in its philosophical or theological sense? Can the language of liturgy return the lost sense of the language as the guardian of human community? What is the relationship between the language of philosophy and the language of theology? Is the theology also becoming an expert knowledge, or should it be the quest for the Word that is guarding us in our faith. What should be the theology in the post-modern times? How to see the end in the blind alley of secularism? More important than raising professional questions is the fact that there are problems placed before us by life itself. An uncontrolled “progress” (does that word have any meaning anymore?) is raising again an almost forgotten question of theodicy, the question of freedom and responsibility, the question of death and meaning of life. What we need is a new anthropology well beyond the disciplinarian entrenchments – anthropology capable of answering the question of anthropodicy, the question of man’s responsibility for the evil prevailing in the world. How should the Evil be confronted? – which is today, as never before, making such a successful carrier, the Evil which has become so ordinary and banal, that this propels its ever growing spectacularity. In actual fact, we are standing in the face of a practical obligation for an ethic and political resistance to moral and social evil, and not before a theoretical demand for its definitive explanation. How are we to confront evil if we tend to forget? How are we to fight against oblivion, in favor of an anamnetic culture – and the culture of responsibility for another? What does philosophy and theology have to say about that other one, thy fellow man, and of the Other as transcendence? Philosophy and theology, do they have a therapeutic knowledge? Philosophy and theology, can they heal our wounds? 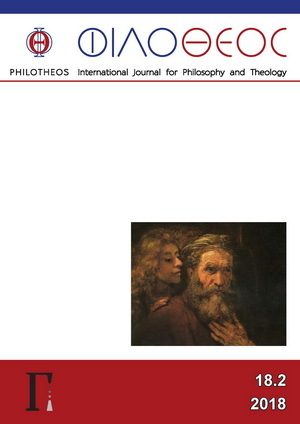 International Journal for Philosophy and Theology PHILOTHEOS has the aim to provide a forum for a dialogue in philosophy and in theology respectively, and especially a dialogue between philosophy and theology. We wish to extend our warmest gratitude to the colleagues who had kindly responded to our call for co-operation, and our invitation for co-operation stands open.